Well I thought I was all done with my pre-Christmas shopping but then a friend at work told me that Kohl’s had their Jansport backpacks on clearance so I had to make another trip back today and boy did I score! These backpacks all retail for between $59 and $89 but I got them on clearance today for between $4.80 and $12.80, PLUS I got to use a 30% off coupon AND I got $10 back in Kohl’s Cash. I saved a whopping $375.41 and that doesn’t even include the $10 Kohl’s cash. 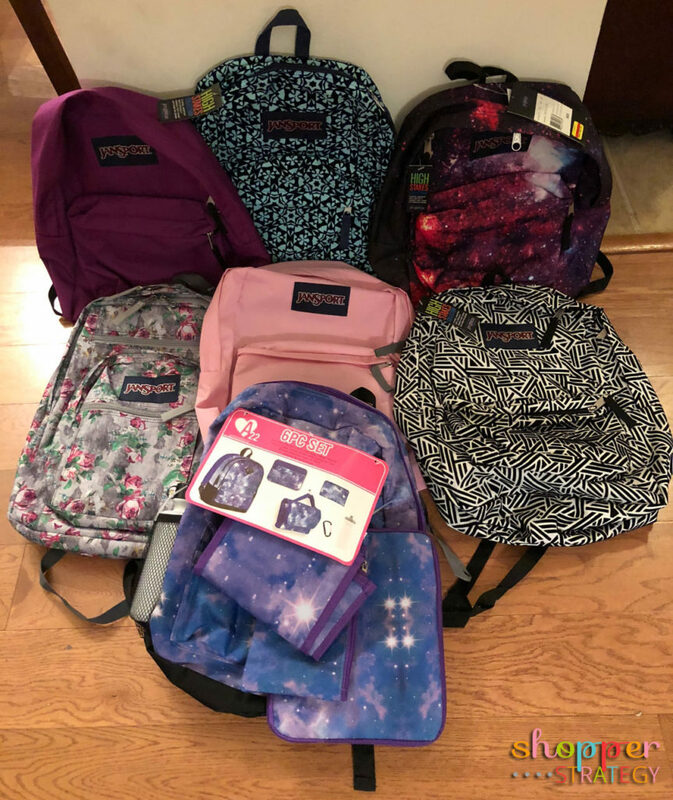 With five kids I seem to spend a small fortune on backpacks for back to school each year so I’m thrilled to have stocked them up for next year at these bargain prices. Great Gift Ideas for Guys & Win a Gift Basket! Disclosure – A gift basket was provided for this review and for giveaway, no other compensation was received. All thoughts and opinions are my own. Do you find it as hard to shop for gifts for the men in your life as I do? I never know what to get for my brothers, dad or guy friends for birthdays and holidays. How many years in a row do they want flannel pj’s? 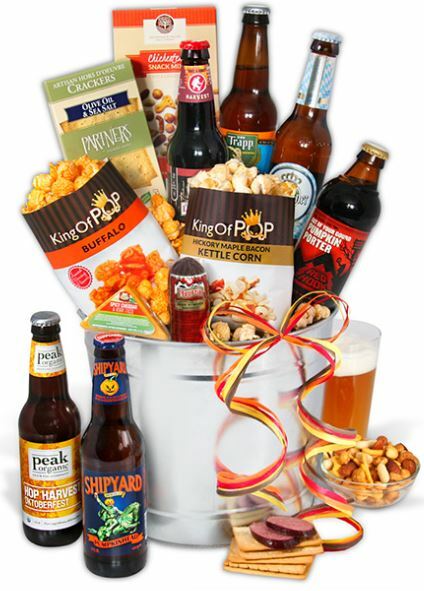 On the other hand, beer and snacks are always gladly appreciated so I recently selected this Fall Seasonal Beer Bucket from GourmetGiftBaskets.com for one of my best friends birthdays. He was thrilled with the gift and I was very happy with how carefully it was packaged and how great it looked right out of the box. I was also allowed to share some of the beer and can attest that the selection was delicious! Bacon. It’s more than a food. It’s a way of life for many, including myself! 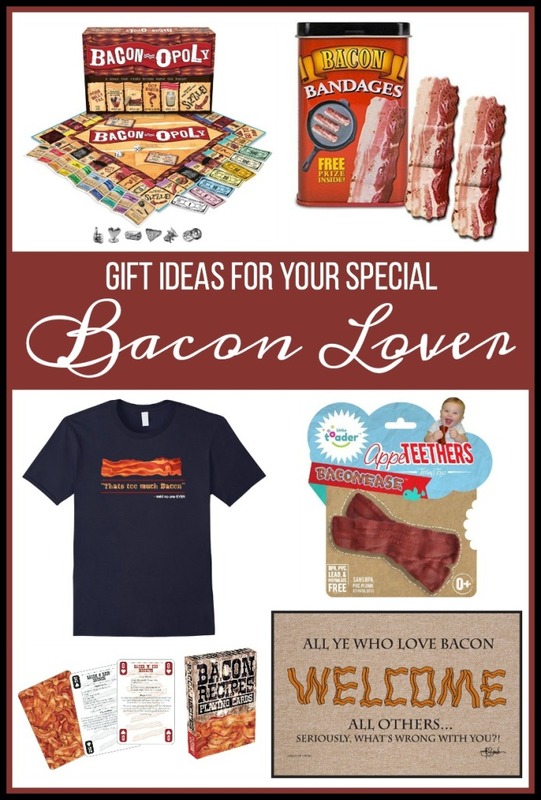 If you have a bacon lover to buy for this holiday, we have compiled some great gift ideas for you! There are many smartphone apps that can help you save money on not only things you buy everyday but toys, games, and clothes. For instance Target’s Cartwheel app, as well as Michaels, Hobby Lobby and many more apps often contain percentage off and other coupons. As we get closer to the holidays you will notice an influx of coupons on hot toys of the season in grocery coupon inserts as well as printable online coupons. Companies like Mattel, Milton Bradley, and a few others will put out coupons that when combined with sales make for amazing deals! This may seem like a no brainer but really, when you see an item that is on your list at a great price, go ahead and grab it. Saving $2 or $3 dollars later on is probably not worth the running around, long lines, and gas money. While it may be a little late for this year, you can start right after Christmas building a gift closet for next year. While tastes change, and your kids may not demand the hottest Star Wars toys next year there are plenty of simple items like clothing, stocking stuffers, cologne, and beauty products that you can pick up at a heavily discounted price after Christmas. Designate a large tub in your closet or somewhere else convenient and fill it with gifts throughout the year as you find amazing deals. We use ours for unexpected birthdays, hostess gifts, and of course I am always stocking up for kids Christmas and birthdays. So many stores have begun to price match against other stores paper or online ads that there is no reason to pay more or run around to 3 or 4 places to get a great deal. Most places will also match Amazon’s listed prices so look them up on your smartphone while shopping. Purchase discounted giftcards at GiftCardRescue.com and Giftcards.com for anywhere from 5%-30% off the value. Use a $100 card that you purchased for $80 in conjunction with sales and coupons – you won’t believe how much you save. Get with friends and relatives at the start of the holidays and agree in advance to only buy for the kids or opt to draw names so you are only buying for one person or couple in the family instead of every third cousin and great uncle. Not last years fruit cake of course… But if you receive gifts that just don’t fit you or your lifestyle there is no harm in re-gifting. Just be selective with who you regift to, make sure that the original giver and the new recipient do not run in the same circles. Your pet sitter who keeps her nails meticulous might love the nail dryer Aunt Helen gave you. 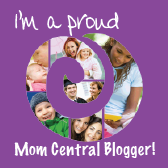 I never buy anything online or head out to the stores without first checking RetailMeNot.com for discount codes. You can find everything from restaurants to photo developing on there and you can save a ton overall. Search sites like PriceGrabber.com for the best deals. Scope out reviews also – cheaper does not mean you will save more money in the long run and more expensive doesn’t necessarily mean the item will last longer. Set a budget up front and stick to it. Oftentimes the thing that costs us the most is mindless spending with no aim in mind, and not knowing what you have spent until you pull the tangle of receipts from your purse at the end of the day. Have a list and do your best to stick to it at all costs. I just recently spent a few days at a beach resort where there were six weddings going on over the weekend. We got to mix and mingle with groomsmen and bridesmaids galore and the wedding revelry was awesome. 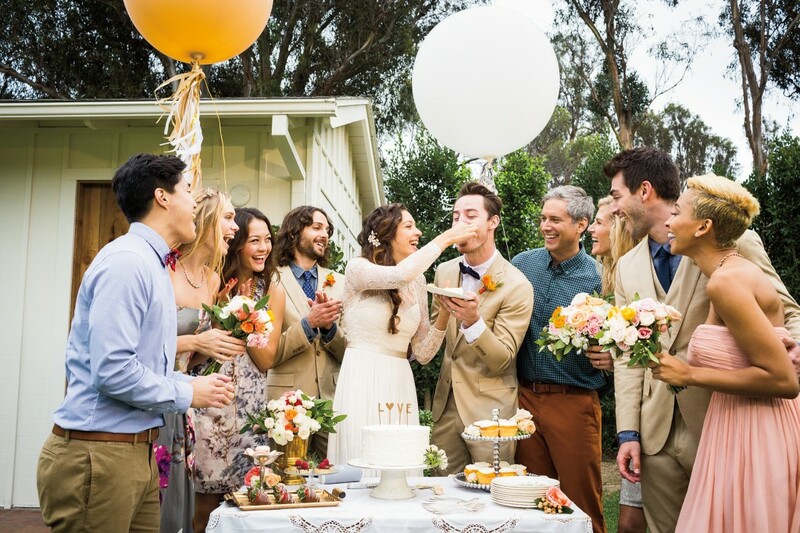 I’m currently single but if my boyfriend wanted to “put a ring on it” I’d be ecstatic so I thought I’d share some wedding registry ideas. My oldest son is ten years old and he loves to make videos of anything and everything. If you ask him what he wants to be when he grows up he’ll tell you he wants to be a “YouTuber”, he wants to make videos for a living. I think he’s learning some great skills that he can hopefully put to use later in life and I really enjoy watching some of the videos he’s been taking of himself and his siblings playing and creating things. He’d go absolutely nuts if he could take some videos from the air using a drone like this new 3DRobotics Solo Drone at Best Buy. It’s the first ever drone powered by two integrated Linux computers, which makes it super easy for anyone to capture perfect photos and videos. 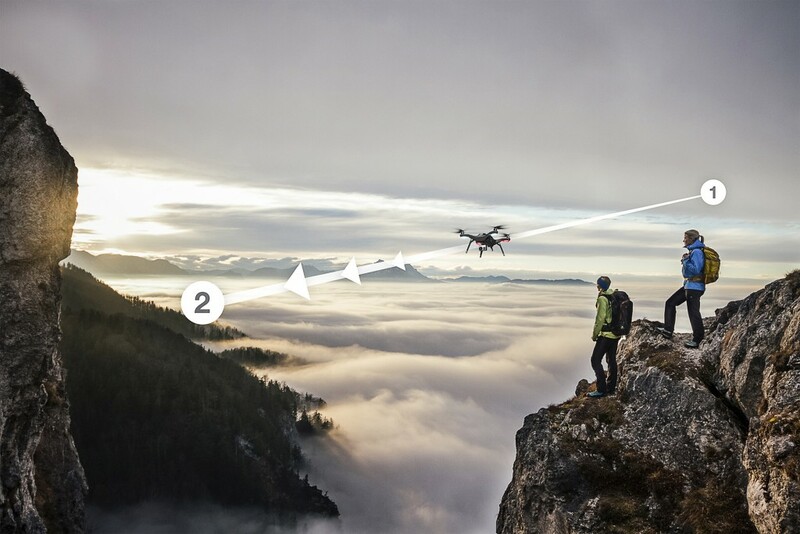 The Solo drone can even define its own flight, freeing the user up to focus on getting the perfect shot. I think the neatest thing is that it’s also the first drone to support full control of GoPro cameras, plus it can deliver live HD video to your mobile device wirelessly or through the controller’s HDMI port so you can get live broadcasts. 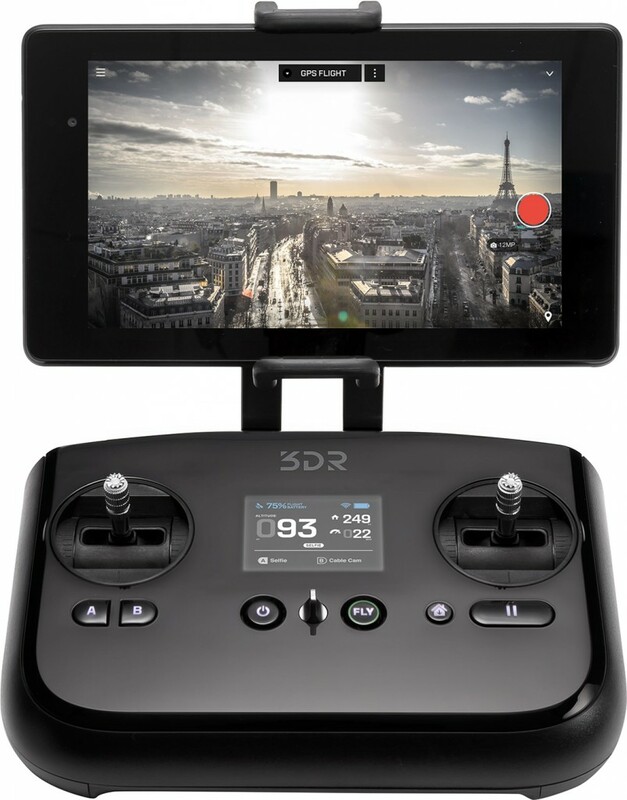 The 3DR Solo is a smart drone that is designed for easy flying and it has awesome features like computer assisted Smart Shots and push button flight. The 3DRobotics Solo Drone is available right now at Best Buy, just in time for Father’s Day and I’ve read that drones are going to be one of the hottest Christmas gifts of the year. 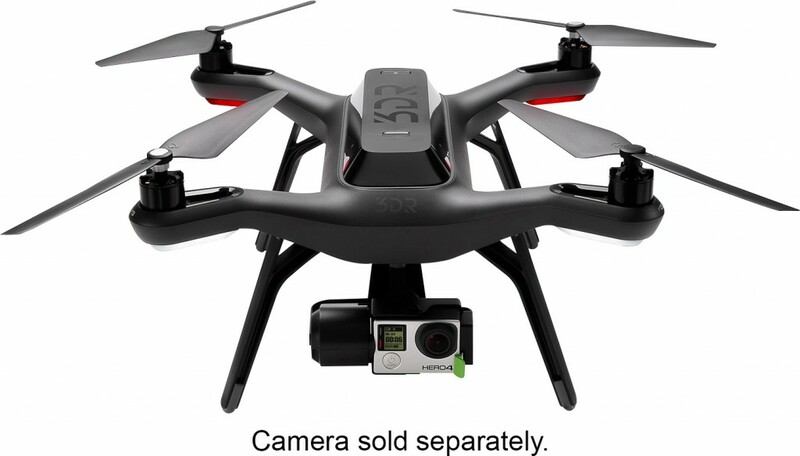 Best Buy is the destination for drones, including the Solo which retails for $999. Now through July 11th you can get a FREE Solo Mart Battery (RV $149.99) when you purchase the 3DR Solo Drone. Want to Find a Different and Fresh Gift Idea? It is not easy and sometimes very time consuming when you need think of a gift for a distant relative or someone at work. You want to give something thoughtful and special, but not knowing their tastes can be daunting. These ideas will help you find a gift that will show that you care about them and that you put a lot of thought into your gift. You can personalize the gift and convey the message you want. Although probably not the first sweet gift that comes to mind, rock candy is the perfect gift for any occasion. Popular for its uniqueness and because it is easy to carry and share, it makes a great Christmas gift or a wedding, birthday, or anniversary present. 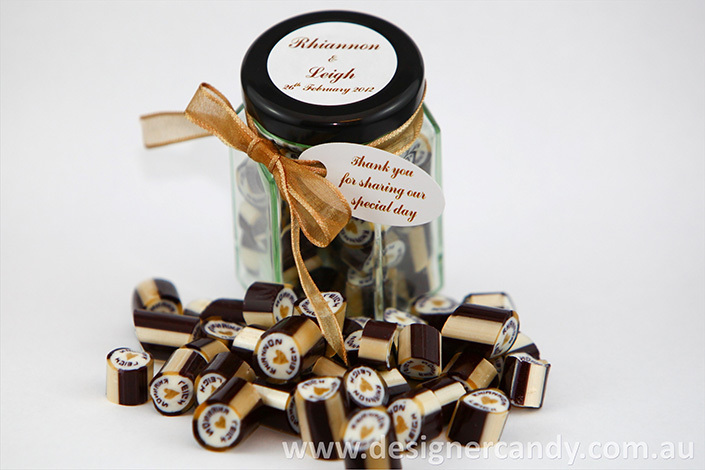 You can make it extra special by personalising the rock candy specifically for the person you want to give it to. This way, you can give the same gift to more than one person, and it is still unique. A sure way to bring a smile to someone’s face is by designing an old fashioned lollipop centerpiece. You can let your imagination take over and design a sweet treat that will satisfy anyone’s sweet tooth and bring laughter to the table. No matter what their age, a delicious, colourful, personalised lollipop will be an excellent gift that is suitable for all occasions. You can feel happy that you are giving something that is fun, tasty and made just for the person. Maybe you have a gift but are stumped about how to wrap and present it. 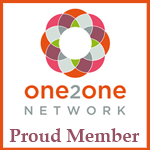 You can add flair and individuality and make a winning presentation by incorporating all sorts of personalised things. 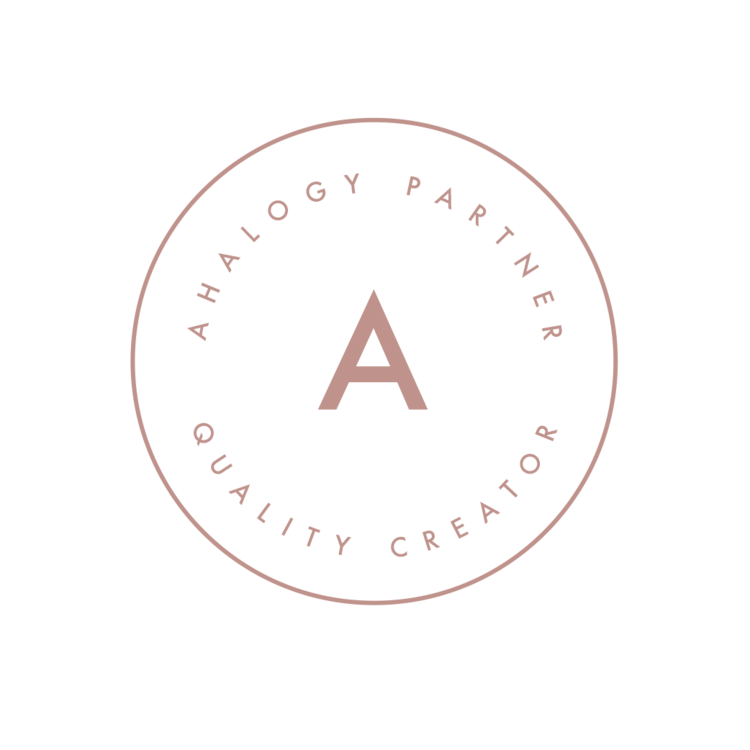 Tags and stickers that have designs or messages specially chosen by you for a particular person can really make a gift distinct and eccentric. Or, you can tie it up with ribbon that you have personalised. These finishing touches can turn an ordinary gift into something special and bring joy and laughter to the person even before they open it. Visit Designer Candy at http://designercandy.com.au/ for more exquisite and personalized ideas for gifts including our best old-fashioned lollipops. You will find interesting and fun gifts that will show your thoughtfulness and that you care. You don’t have to settle for a boring gift you have given many times before. No matter what the occasion, it is up to you decide on the perfect gift. Whether it is a close family member or friend, your boss or a co-worker, you can put together a personalised gift of fun old-fashioned lollipops that will give the exact message you want. 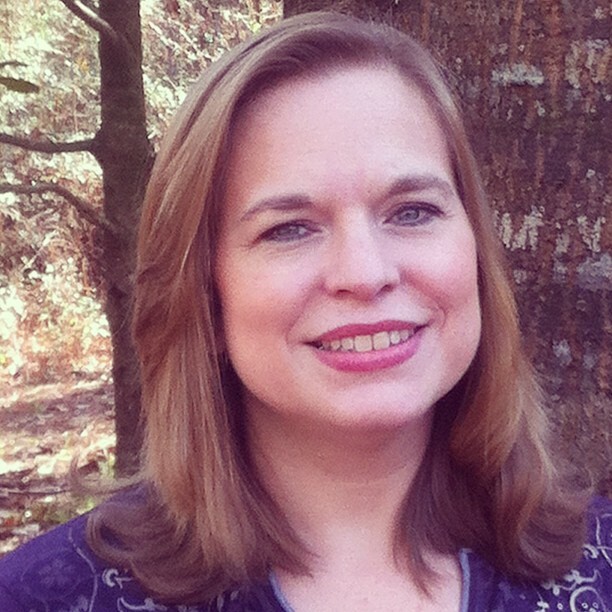 As wonderful as the holiday season is, it can also be a stressful time. One source of stress could be the uncertainty of what gifts to buy for those on your holiday gift list. A few other trying moments might arise as you strive to create a holiday home decor that is as exquisite as those you see on display or one that is unique to your design style. One way to ease some of your holiday stress comes from a tradition that started many years ago. It’s origin is explained in numerous ways, but regardless of how the tradition of hanging stockings at Christmas began, it’s a tradition that continues to delight children and adults today. Each person in your family has a unique personality. The display of stockings you hang during the holidays can be a visual example of those personalities. 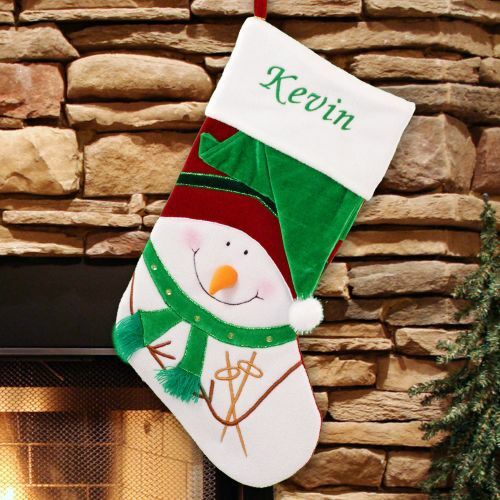 Not only can you hang stockings that have been personalized with each person’s name, you can hang stocking that directly relate to each person’s personality. From whimsical to elegant and from camo to purple velvet, there’s a stocking that complements all personalities. Your holiday stocking display can be somewhat like a family portrait when you hang individualized stockings. You’ll want to be sure to include pet theme stockings for the furry ones in your household. Personalized gifts tend to become treasured keepsakes. You can eliminate a lot of your gift selection stress when you browse through the stocking designs at a site such as http://www.giftsforyounow.com/personalized-christmas-stockings 559.aspx. Matching a stocking design to a someone’s personality and having their name put on it is a thoughtful gift that is sure to reappear each year when the holiday decorations are unpacked. Long after the surprises that are placed in the stocking have been eaten or used, the stocking itself will continue to be a treasured part of each holiday season. You can select stockings that are traditional or ones that are far beyond traditional in design to add to your holiday decor. Adding your personal touch to them makes them a more treasured part of your holiday decorations. Decorating your home with stockings that are a display of each person’s individuality can make everyone feel special. The holidays are all about family, friends and special moments. A personalized gift can be a tangible memento that preserves those special moments. 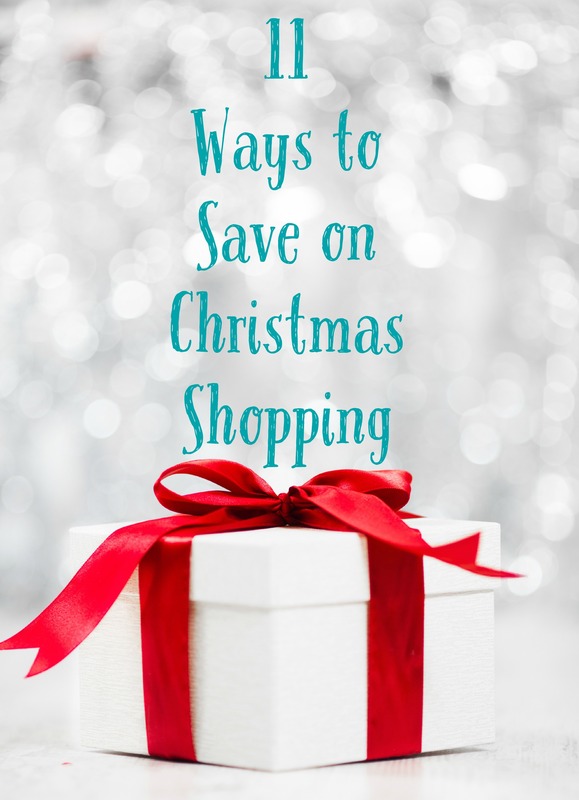 I’m already in full Christmas gift shopping mode – with five kids and a large extended family on a not so large budget I have to do lots of planning and I can’t wait until the last minute to do my shopping or I’ll inadvertently leave someone out or end up breaking the budget. One of the things that makes my gift list a little easier to handle is knowing in advance where I can get the best deals on the best products, narrowing the shopping down to just a few places takes a lot of stress out of the season for me. Another great strategy is to have a plan in place for how much I can spend on each person and when it comes to the kids, who expect to get more than a gift or two, how to divide up their portion of the gift budget. Santa Claus still brings the kids gifts and he brings me gifts too because I wouldn’t want the kids to think I’d been bad during the year, but I always make sure the best gifts come from mommy. I also like to get at least one “household” gift, something big for the whole family to share. A few months ago a lightning strike took out our living room television so I’m thinking this year’s “big” family gift is going to be a new TV and boy do they have some great choices at Best Buy! I am really impressed with LG’s new technology, the LG OLED TV, featuring picture quality including Infinite contrast ratio. 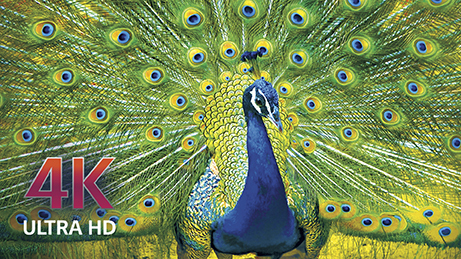 Check out this stunning color that gives a greater sense of realism and depth. Plus the TV has a super thin design at only 0.21″ thick at its thinnest point and the intuitive webOS™Smart TV interface that lets you find content faster. The LG OLED TV retails for $3,999.99 but you can save $500 with Best Buy’s everyday low price of $3,499.99 so I’m definitely thinking “Santa” will be bringing us one this year! Disclosure – The reviewer has been compensated in the form of a Best Buy Gift Card and/or received the product/service at a reduced price or for free. Whether the graduates in your life are setting up a room or apartment of their home, are fitness fanatics or are technology forward, you can find lots of great reasonably priced gift ideas at Best Buy! 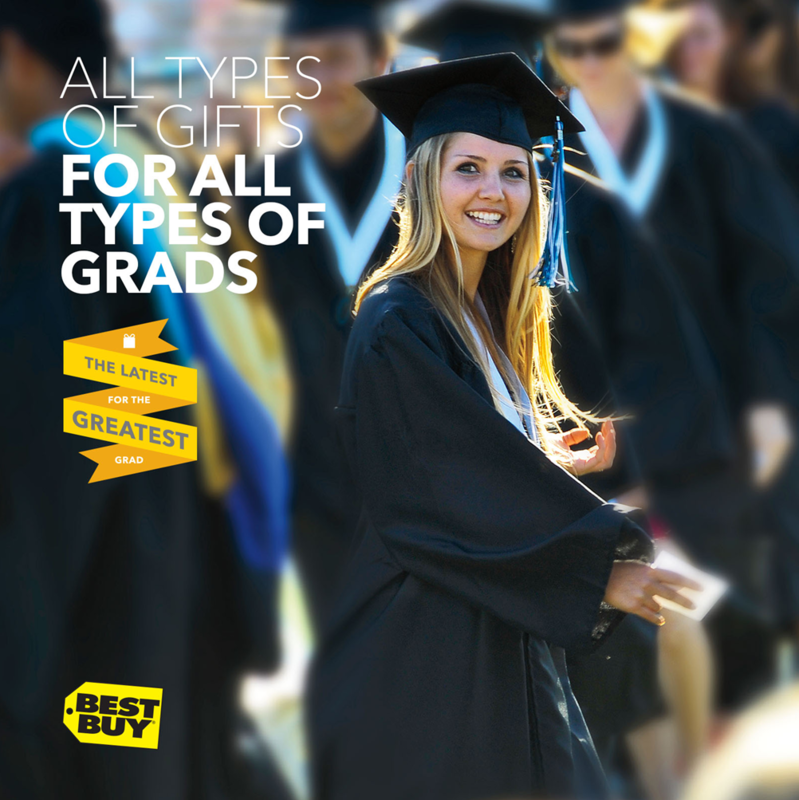 Check out the latest for your greatest grad in the Best Buy gift center and you’re sure to find something perfect.